A publicly-owned company working to revive run-down parts of west Cornwall says it is still on course to carry out a compulsory purchase of South Crofty tin mine. Officials from the Camborne, Pool and Redruth Regeneration Company this week met the site's owners, Baseresult Holdings, who want to develop it for mining. But the talks have produced little change. The official line from both sides is that the talks are to continue, but the regeneration body said it would begin the official process that paves the way for compulsory purchase. 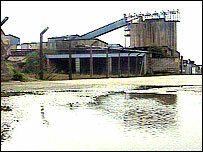 The dispute between the two bodies is whether or not Baseresult has a realistic prospect of breathing new life into the prominent and run-down South Crofty site. Baseresult insists it remains committed to redeveloping the mine site in partnership with a developer, and a viable tin mine was still its key objective. It submitted plans to Kerrier District Council seven days ago to restart mining at South Crofty and build hundreds of houses on the site. But the government-funded regeneration company dismissed the plan and said it was ready, willing and able to buy some or all of the site, using the force of law if needed. Baseresult's plans also received a sceptical reaction from former miners and local councillors.